"There is magnitude in light, even if only a pinprick. 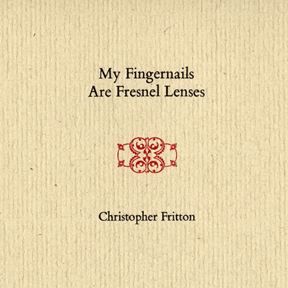 Christopher Fritton’s chapbook itself is miniscule, measuring a light four by four inches, but in its case, it is not volume or quantity that matters, but contentthough it is handsomely presented in a hand-set, letterpress-printed, hand-stitched volume. ... Light is literally knowledge, and knowledge light, rendered here beautifully in a memorable little book." "The design is like the Cloverfield letterpress of Miranda July's The Boy from Lam Kien. Fritton's poem is dense & good." "The book is a tiny marvel of concision. ... The book is a short read of elegance and insight. ... Read slowly to enjoy." "Christopher Fritton gives us a kiss; he gives us all the thoughts perceived by him, behind a long kiss, an intimate kiss. He whispers in our ear as only a lover can. We are privy to something special. We alone, are the only ones to ever be loved in this new way, everlasting, evermore, that has ever been, that will ever be." "Fritton’s poem is a testament to the prolific distance art can travel when it travels light. It is also a love poem, and a wonderful one at that, you’ll love it." Named a May-June Pick in the Small Press Review. Buffalo Rising interviewed Fritton and wrote a nice little piece about My Fingernails Are Fresnel Lenses.